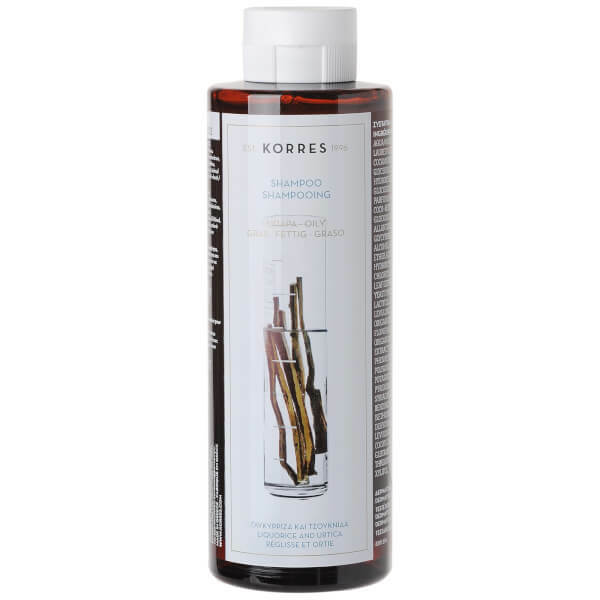 KORRES Liquorice & Urtica Shampoo has been specially formulated to help deal with oily / greasy hair. This complete cleansing shampoo gently controls the level of oil in the hair and on the scalp without completely stripping the hair of its natural oils. 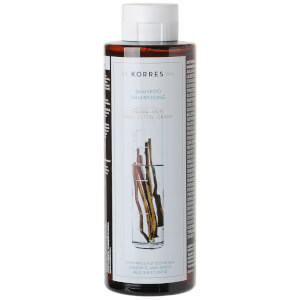 KORRES Liquorice & Urtica Shampoo is gentle enough to be used daily. Aqua/Water/Eau, Sodium Laureth Sulfate, Cocamidopropyl Betaine, Potassium Olivoyl Hydrolyzed Wheat Protein, Alcohol, Benzoic Acid, Biotin, Butylene Glycol, Coco-Glucoside, Dehydroacetic Acid, Ethylhexylglycerin, Glycerin, Glyceryl Oleate, Glycine Soja (Soybean) Oil, Glycine Soja (Soybean) Sterols, Glycolipids, Guar Hydroxypropyltrimonium Chloride, Helianthus Annuus (Sunflower) Seed Extract, Hexyl Cinnamal, Hydrolyzed Wheat Protein, Hydrolyzed Wheat Starch, Hydroxyethyl Cetyldimonium Phosphate, Hydroxyethyl Ethylcellulose, Hydroxyisohexyl 3-Cyclohexene Carboxaldehyde, Lactic Acid, Lactitol, Laurdimonium Hydroxypropyl Hydrolyzed Keratin, Linalool, Niacinamide, Origanum Dictamnus Flower/ Leaf/ Stem Extract, Origanum Majorana Leaf Extract, Panthenol, Parfum (Fragrance), Phenoxyethanol, Phospholipids, Polyaminopropyl Biguanide, Polysorbate 80, Potassium Sorbate, Sideritis Syriaca Extract, Sodium Benzoate, Sodium Chloride, Sodium Cocoamphopropionate, Sodium Gluconate, Starch Hydroxypropyltrimonium Chloride, Xylitol. This is a quality product at a realistic price. It washes oily hair extremely well and leaves it feeling clean, soft and in good condition. I've been using this product every day for a more than six months and I'm as happy with it now as I was the first time I used it. Highly recommended.